Every yard looks better with a mature shade tree in it. Trees add permanence and weight to the landscape. To make the tree look like it belongs there, we often ring the base of the trunk with flowers and plants. Unfortunately, as the tree grows and its branches and roots expand, the area around it becomes a barren wasteland. The tree roots quickly soak up all available water and do a great job of blocking the sun, so few plants choose to grow there. Don't give up and create a volcano of mulch around your trees. It is possible to plant under a tree if you choose wisely and start small. Follow these 10 tips to get plants established and happy growing under there. It's hard to believe, but trees can be very sensitive to any damage to their roots and bark. Some trees, such as beeches, cherries, plums, dogwoods, magnolias, and maples, have very shallow roots that are barely below the soil surface and hate having those roots disturbed. Be very careful digging around the roots. Use a trowel or digging knife, rather than a large shovel. If you encounter a root, move to another spot. Also, avoid damaging the bark at the base of the tree. Any injury is an invitation for disease and pests to find their way inside the tree. Since you cannot dig holes to accommodate large plants under your tree, you will need to plant small seedlings or divisions. You may be able to buy small "liner" plants in bulk for some mail-order nurseries. These are seedlings that are intended to be grown on at nurseries and sold as plants in garden centers. If you can find a source for liners, you'll save a lot of money. Of course, you could always start your own. The main concern is that you want seedlings with small root balls, so you can squeeze them in without digging to wide or deep. This will mean a lot of water at first, but the small plants will adapt more easily to their cramped quarters than a large plant would, and you won't hurt your tree in the process of planting. Choose a couple of key plants and then plant them in large swaths. This is especially key since you are going to need to plant very small seedlings. Consider including some fast spreading groundcovers, for quick cover, but use caution with this. Plants such as pachysandra, ivy, and ribbon grass (Phalaris arundinacea) will take over the entire yard. Ginger (Asarum), columbine (Aquilegia), and bleeding heart (Dicentra) are better choices. For a natural look, don't circle the tree with a row of plants. Plant all the way up against the tree's trunk. Let your plants flow around the tree. If you plant sprawlers, such as Foamflower (Tiarella) or Laurentia (Isotoma fluviatilis), they will create their own boundaries. Of course, you may have to do a bit of thinning to keep them in check. You aren't going to get an abundance of flowering in the shade of a tree. To ensure you have a colorful display, choose plants with leaves that look good all season. 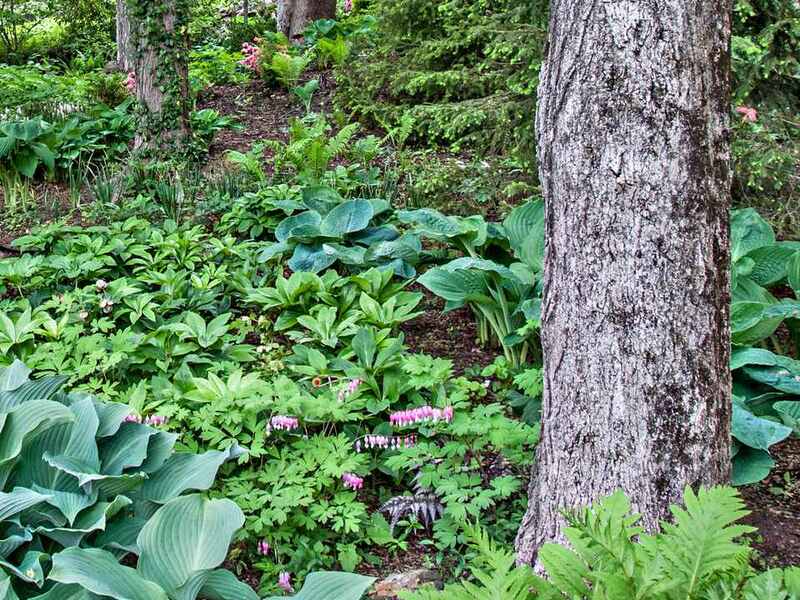 Good choices include: European ginger (Asarum europaeum), Japanese painted ferns (Athyrium niponicum), Hosta, coral bells (Heuchera), Japanese forest grass (Hakonechloa macra), and frilly mayapple (Podophyllum). You can create a beautiful tapestry with just the color of leaves. It helps if you choose plants that can handle some drought. You will still need to give your plants some TLC for their first year, no matter what you plant. But it will be easier on the plants, and you, if you choose plants that won't need a lot of supplemental watering during dry spells when the tree's roots will soak up all available moisture. Take advantage of early spring, before the tree leafs out, and include flowering bulbs, especially small ones like crocus, dwarf iris, and Glory in the Snow (Chionodoxa). Another good choice would be spring ephemerals. Plants like bloodroot (Sanguinaria canadensis), Dutchman's breeches (Dicentra cucullaria), trillium, and Virginia bluebells (Mertensia virginica) tend to disappear, when the temperature warms up, making space for your regular season plants to fill in. To give your underplanting some drama and eye-catching appeal, add a splash of unexpected bold color or unusual texture. It will add another dimension of beauty and make your planting look. Some bright colored leaves fade out in the shade, so make sure your drama queen gets some sunlight by planting it toward the outer edge of the branches. Your yard will be more cohesive if you include the palette of plants you used under your tree in another spot in the garden. Don't just use it under trees; any shady area will work, maybe by a bench or along a path or in that tiny side yard that doesn't have enough space or sun for a flower border. To keep your tree garden healthy, add a couple of inches of organic mulch or compost. You'll be creating that rich "forest floor" effect that makes woodlands grow so lushly. The mulch will help retain precious moisture give the plants a little boost. Reapply the mulch each year in early spring, before the plants have a chance to leaf out. Just be careful not to bury the plants under it. To successfully plant under a large tree, there is a bit of effort up front. But once your plants have adapted to their new home, the garden will get better each year. You will even be able to make more divisions to plant in another spot in the yard.